Please note: This blog post has not bee updated since Feb. 2017. For updated information, one helpful source is the Shanghai government’s Interpretation of the 144-Hour Visa-Exemption Transit Policy (May 2, 2018). See also the city list on Timatic (links below). PEK, KWL, HRB, KMG, and SHE count the 72 hours between scheduled arrival and scheduled departure. Upon arrival, request entry under the TWOV program from the immigration inspector in the airport or other port. In some ports, there are special immigration inspection lanes for the program. The traveler may apply to the local pubic security bureau (PSB) exit-entry administration department for an extension or to leave the specified geographic area. When you are checking in and boarding your plane at a foreign airport, the airlines personnel routinely check passengers visas. They may be unfamiliar with the transit visa waiver program. Bring a printout from Timatic to show you qualify for the waiver. Upon arrival in China, make sure you have available to show immigration authorities a printed itinerary for your departing flight or other transportation showing it has already been ticketed. What’s the Policy Behind the TWOV Program? A transit visa allows its holder to pass through a country en route to a final destination outside its borders. Some countries require transit visas even for passengers that will catch a connecting flight without exiting the airport through passport control. For example, the U.S., UK, and France all require transit visas and also may waive the visa requirement in certain situations. China’s State Council has authorized the TWOV program at selected ports as a way to promote international travel through its ports and give a boost to local industries serving travelers for business and pleasure. Think of a transit visa waiver as a modern analogy to the oasis that allowed Turpan to become a commercial hub on the silk road, or the free bathroom that attracts travelers to fast food restaurants along the highway. Timatic via KLM, FlyerTalk, or Skyteam. The Ministry of Public Security (MPS) has issued Answers to Frequently Asked Questions Concerning 72-Hour Transit Visa Exemption for Foreign Nationals. 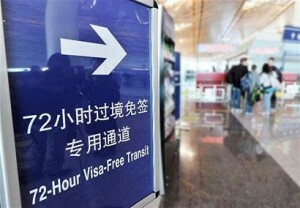 MPS has also issued an announcement about the 144-Hour Visa-Free Transit Policy for Shanghai, Jiangsu, Zhejiang. What do you think? Feel free to add your questions or describe your experiences in the “comments” area below. For purposes of the visa waiver, can my flight originate or depart to Hong Kong? In other words, is Hong Kong considered a “third country or region”? Are Macao and Taiwan also considered third countries or regions in this context? Can you fly out of Hong Kong into Beijing and then back into Macau or Taiwan and qualify for the 72 hr visa waiver? I’m flying from Phuket to Shanghai, then within the 72h i have a flight for Paris but i make a stop in Doha between Shanghai and Paris, so it’s not really a third country but 4 countries, is it still working ? Yes. The term “third country or region” here means that you are departing for a country or region that (a) is not in Mainland China and (b) is not the same country or region from where your flight to Mainland China originated. Is there a definition of the term “Region” in the context of the 72 hour Transit Visa Waiver? For example, are both Oslo and Copenhagen in the “Scandinavia” region? No. When China uses the phrase “countries and regions,” the word region refers to Taiwan (not recognized as a country) as well as Hong Kong and Macau, which are subnational entities of the PRC which have separate visa regimes. Thank you for the very concise, helpful and timely reply. I heared, that Dalian is now also one of the designated airports for the 72-visa waiver program. Yes, thanks! Shown in alphabetical order above. My understanding is that the 72 hour period is calculated based on the “scheduled arrival and departure” times of the flight and not when the waiver is granted. This is what I was told when calling the Immigration office at the Beijing airport. This also makes total sense. How can the airline know when you will be given your stamp while you are checking in for your flight? Hanging around the airport before passing immigration is not a valid strategy. Also note that in the case of Guangzhou, the 72 hour period starts at midnight on the next day giving you potentially up to 95h59min. that says that from 1 June 2014 Xi’an would be included in the group of cities applying the 72 hour transit visa exemption rule. Is this information correct? Is Xi’an now applying this rule? My question is: Are there any restrictions on the number of times within a certain time period that one can apply and/or reapply for a 72 hour Visa? For example: I planned 6 days for my China leg of my trip arrive Shanghai depart Beijing. This requires a Visa that I do not have time to process before I arrive. Therefore I was planning to arrive in Shanghai, apply for the 72 hour visa and spend 2 days there, then fly to Taipei, Taiwan for a day then head to Beijing for the remainder of my time up to 3 days and again apply for the 72 hour visa. There’s no specific limits on the number of times you may enter China. Still, each time, the immigration inspector may ask you questions to confirm you are likely to comply with the terms of your stay (e.g., you haven’t take a job in China). I’m an American living in Taiwan. I need to attend an expo in Shanghai. If I book a flight from Taipei to Shanghai with a transfer flight in Hong Kong, would this qualify for the 72-hour visa waiver? No. You have to have a flight booked to depart mainland China within 72 hours of arrival. For example, you could fly Taipei to Shanghai, then within 72 hours fly to Hong Kong. Good catch. There are new stories of the State Council approving of Nanjing for participation in the 72-hour waiver program, one of which is linked above. The airport’s website also confirms this. But neither Timatic nor the airport website show actual implementation of the program. What does your airlines say? Excellent info here. Even the folks at the Bejing Embassy are convineced I need a $250 visa just for my 3 day stay in SHanghai. I clled the airline (MU) and they confirmed this is the policy. However just to be safe you suggested to print out a letter for the link for “Bring a printout from Titamic to show you qualify for the waiver” , but it seems to be broken. Keep up the great work! I’m currently a U.S. Citizen and of Tibetan origin, I plan to accompany my fiancé, who is a Chinese citizen, to the U.S. embassy for her K1 visa. Would my place of birth be a problem even though I meet all of the requirements for the 72 hour visa. Further details would be helpful for me to understand your question. 1. You mention that you are “currently” a U.S. citizen. If you were a PRC national and then naturalized as a U.S. citizen, then you automatically lost your PRC citizenship. The PRC government may be aware of this if you subsequently applied for a PRC visa and turned in your PRC passport for cancellation. And you may have cancelled your hukou. Is all of this true in your case? 2. The 72-hour visa waiver program is for persons transiting through China on their way from Country A to Country B. Is this your plan? 3. You mention that your fiancée is a applying for a K-1 visa at the U.S. “Embassy” in China. The Embassy is located in Beijing. 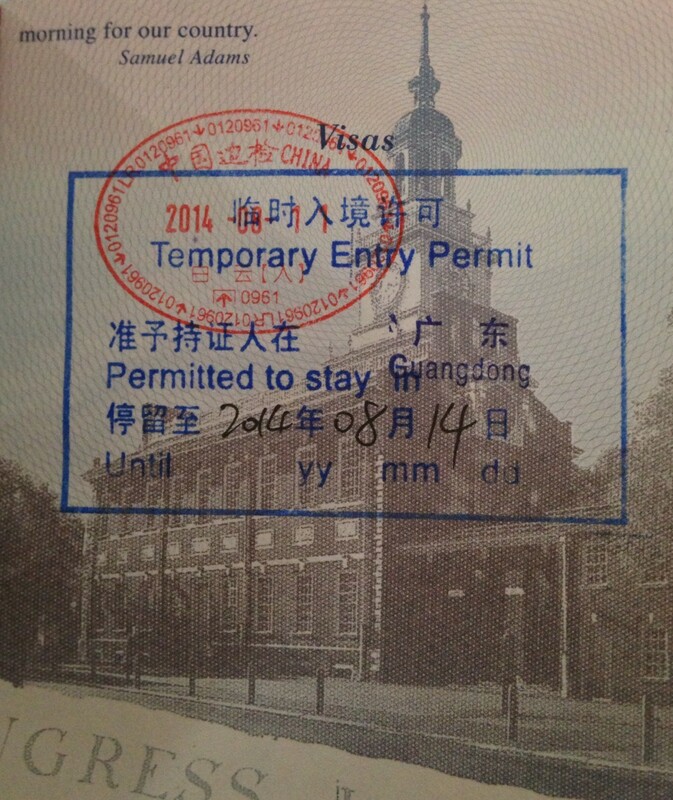 But the only post that issues K-1 visas in China is the U.S. Consulate General in Guangzhou. Do you plan to transit through Guangzhou? Hello, we are travelling to China for the first time this year. We are flying into Beijing, spending three nights there. Flying down to Shanghai, where we take a cruise around Japan for 10 days & then arrive back into Shanghai where we will spend two days. Would we be eligible for the 72 hour visa free transit in Beijing & Shanghai ? Caron: No. You wouldn’t be allowed to enter Beijing with the visa waiver because you don’t fit within the rule: Traveler must have a ticket proving an onward flight from the same China city to a “third country or region” (not the originating country and not in Mainland China) with a confirmed date and seat within 72 hours of arrival. Yes. Chicago > Hong Kong > Shanghai > Chicago is an OK itinerary to use the transit without visa program. For the Guangzhou 72-hour TWOV program, do I have to travel by air, or I can use the ferry? Andy: For the 72-hour TWOV program, you can only enter and exit through the same designated international airport. For the 144-hour TWOV program in Shanghai/Zhejiang/Jiangsu, you have more options, as explained above. Does the 144-hour TWOV program apply when I have a ticket from Hong Kong to Shanghai with one airline, and another ticket from from Shanghai to Macau on a different airline? Yes, as mentioned above, the arriving and departing tickets may be on different airlines. If you’re looking for something to do during your 72 hours in Beijing, here’s a company called Airport Layover Tours that designs tours with the 72-hour transit without visa in mind: http://www.beijing-airport-transportation.com/airport-layover-tours. I haven’t used their services, but they seem to have pretty good reviews on Trip Advisor. Has anybody else used their services? My wife and I are traveling from Amsterdam > Singapore > Kuala Lumpur > Hanoi > Shanghai > Istanbul > Amsterdam. Can we use the 144-hour visa free transit in Shanghai, even though our trip begins and ends in Amsterdam? Azamy: Yes. See the New York -> Beijing -> Tokyo -> New York example in point 3 above. Not sure where to leave TWOV comment. Thanks for your advice over the past couple of years. Here are Some updates about my recent experiences with 144-h TWOV, arriving Shanghai and departing Nanjing. Last December I succeeded to board Spring Airlines in Ibaraki (Japan) to Pudong. I wisely took hard copies of the advice and Spring checked their manuals for about 30 mins and let me board. Last Thursday I was travelling with China Eastern from Singapore to Pudong, then a couple of days later from Nanjing to Seoul. I wrongly assumed this would be even simpler than my last trip. I was given a boarding pass at SIN (with minor discussion of the TWOV). However, 30 mins before departure I was extracted at 0100 from the gate area and removed from the secure area. The check-in person had decided without re-consulting me that I did not qualify for TWOV and produced a Thematic printout being for the standard 24-hour TWOV, but my 2-day stay in China would exceed the 24-hour limit. I told him he should have a 144-hour printout. He refused to ring the Shanghai immigration “hotline” number, or accept the relevance of my previous TWOV visa stamps from last December. He ignored a display of your internet page and a similar one. He said I was being removed regardless of what I said. He said my only recourse was to negotiate with the China Eastern agent who would come on duty at 0800. This duly happened. He had quite a long phone conversation with a Shanghai immigration officer, and got the same story that I was not allowed to arrive at Pudong and depart from Nanjing. Since I was already going to miss my important scheduled afternoon meeting in Nanjing, I then changed my flights to SIN-PVG-ICN, minus stopover. Needless to say, this caused a lot of chaos arriving in Seoul late in the evening, with no sleep the previous night, and having to find last-minute accommodation. I am amazed that China Eastern (a Shanghai based airline) is so ignorant of the various visa arrangements for arriving in Shanghai. The China Eastern agent tried to tell me that the rules had probably changed, but that is completely false, as on arrival I took a photo (can send) of the advice board next to the 144-hour TWOV counter at Pudong. It agrees completely with what you have been saying, and what I told the China Eastern agents. A moral from my story is to always take along a hard copy of the advice. Here’s an anecdote of a person being denied entry under the Shanghai 144-hour transit visa waiver program in 2017 on the basis that in 2015, when staying at an airBnB, he failed to complete temporary residence registration with the local police station. Apparently, immigration authorities had also flagged him and warned him about the registration problem when he left China in 2015. https://techcrunch.com/2017/11/26/the-time-i-was-turned-away-from-china/. If I plan to fly to Shanghai from South Korea and then back to South Korea will I be able to get the 72 hr transit visa waiver? Ashley: Sorry, no. See requirement #3 above.